14 pp wrappers. Stories and activities involving girls as they should be and behave. Content includs Nancy the little Nurse, a free 'Twinkle' engagement ring premium, Betty Bright-the proper little girl who does everything well, puzzles for the little nurse, Dainty dollies, Sue of the Children's Zoo, Sally Sweet on Sunshine Street, Wendy at Willowtree Farm, Patsy the Panda, The friendly frog, playtime with girls playing jump rope and a Twinkle paper doll anda concluding story titled 'When I Grow Up'. Measures11" x 8 1/2". Some wear. . 28 pp. booklet. Illustrated wraps. The cover depicts an astronomer gazing at the heavens. Designed with advertisments printed on the left and the introduction and horoscopes by sign printed on the right hand page. The horoscope pages are in color and present an overview for those born under the sign. The advertisements are for premiums available from the magazine with the purchase of a subscription. Measures 5 1/2" x 3 1/2". A 3” x 4 1/2” advertising trade card for Au Bon Marche department store in Paris. A first glance it has the appearance of a die-cut card of a child in a high chair. By pushing the base upwards and side flaps inward it creates a 3D chair with a child in a high chair with a standing wheeled lamb toy at front Light wear. Few areas of missing surface litho. The reverse promotes the department store. One of a number of exceptional novelty cards created by the store. The Little Red School House was a trademark of the C. M. Henderson & Co., and an image of it was stamped on the bottom of one of each pair of shoes it sold. In order to promote the company's 'Red School House Shoes', this cut out school house was given out to any boy or girl found wearing or purchasing a pair of the Henderson shoes at participating stores. 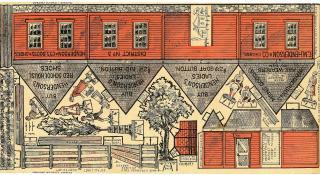 Printed in red and black the uncut sheet includes the red school house, plus cutouts of people, a chimney, trees, and a fence, all which could be assembled with a series of folds and a bottle of glue in order to "construct in miniature the famous little building." Measures 12" x 61/4", uncut. The cut-out compliments of J & A Van Kuren, Whitehall, Mich.. The Jewel Stoves and Rangers were manufactured by the Detroit Stove Works, one of the largest working out of Detroit. One side of the card has one girl doll that is to be placed in the tea party scene below. There are instructions on how to cut the doll and where to cut in the scene so that she is able to sit in the chair across from her doll. It has the logo and a sentence about the company. The reverse side is text that focuses on being the largest stove plant in the world and the quality of their product. Measures 5 1/2" x 4". . It began on March 24, 1895 with the publication of the 11 3/4" litho on card blonde paper doll with the following message on the reverse: The Boston Sunday Herald will issue, each Sunday, a Fashion Plate Supplement which will be in the very latest style and when cut out will exactly fit on this figure. Order the Boston Sunday Herald at Once". With costumes published weekly. On June 16, 1895 the brunette doll was published. The dolls and costumes were this set have all been cut from the supplements. Not only did the costumes present the latest fashions they provide insight into the changing behaviors of the American woman. The costumes include outfits for tennis, bicycling, traveling, skating, bathing, riding and yachting. All activities that would not have been promoted for women in the 1880s. The costumes include all of those produced for the Boston Herald plus a number of additions printed exclusively for other outlets that picked up the series. Plates lithographed by G. H. Buck Co., New York. Series is known to have also appeared in The Brooklyn Times, Cincinnati Commericial Gazeet, The Chicago Record, The New York Mercury, The Philadelphia Press, The Saint Louis Republic, The San Francisco Chronical and the Washington Star..